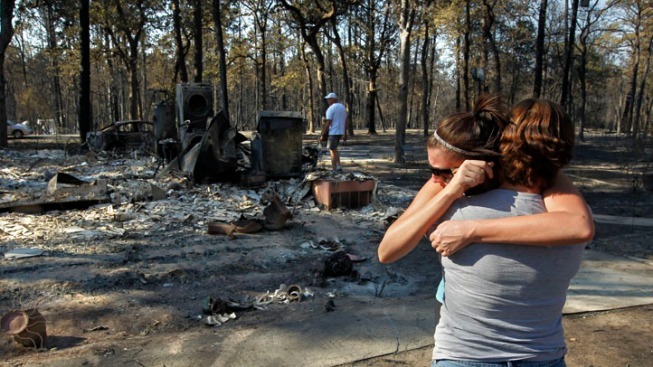 Gaye Jaco (front) hugs her stepdaughter Jennifer Leaver upon returning to their burned down home on the east side of Lake Bastop on September 6, 2011 outside Bastrop, Texas. An Oct. 17 concert featuring Willie Nelson, Lyle Lovett, the Dixie Chicks and the group Asleep at the Wheel will benefit Central Texas wildfire victims. Tickets for Fire Relief: The Concert for Central Texas at the Frank Erwin Center at the Univerity of Texas in Austin go on sale Friday. Wildfires this month in Bastrop County, about 25 miles east of Austin, have left two people dead and destroyed nearly 1,600 homes. The Texas Forest Service says more than 34,000 acres were blackened. Eric Johnson, Steve Miller, Joe Satriani, Shawn Colvin, the Court Yard Hounds and the Texas Tornados will also take part in the concert. Kyle Chandler, who on Sunday won an Emmy for best actor in a drama in the final season of the TV show "Friday Night Lights," will help host the benefit. Chandler recently did public service announcements in support of volunteer firefighters across Texas. The goal of the concert is to help fire victims with long-term issues and problems.